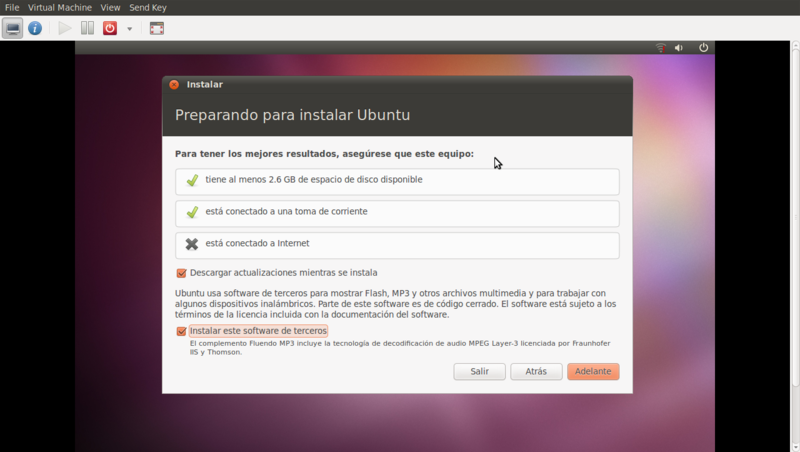 On the first screen, the user is presented with a set of conditions to make the experience of the installation better. It correctly detects the lack of Internet connection but, although it recognizes it, the checkboxes to install 3rd party software and software updates are still enabled. We won't fix this for Maverick now, but assigning to Evan to get it fixed for Oneiric. Since wifi drivers are on (at least some) images, a subset of this works fine with no Internet. For Oneiric, it may still be appropriate to offer this option when Internet is not available. feel free to edit them in place on the wiki. I've committed a partial fix for this to trunk. It disables the "Download updates while installing" checkbox when there is no Internet connection present. I was unable to do this for "Install this third-party software" because that also includes running jockey --auto, which doesn't require an Internet connection. So additional thinking will be required to determine how we handle that. Perhaps showing different text that only mentions drivers when there's no Internet would do it. The release note is fine. My comments are for the fix for Oneiric. Ubiquity now properly disables the "Download updates while installing" option when internet isn't available. As for the third party software, this includes both the binary drivers and ubuntu-restricted-addons. The drivers are included on the CD so it still makes sense to give the option, the addons aren't and won't get installed without internet connectivity (but the installer deals with that properly => doesn't crash).